One of the many benefits of writing this blog for the last 8 years is I have learnt a lot of lessons from each and every ultra I have run. I like to make a list of these lessons and regularly before running an ultra I will reread what I learnt from last time. Generally I have found that I learn the most from the tough ones but I want to write down what worked well in this one as most things did!! At the beginning of the year I weighed 12st 13lbs and I set myself a goal of getting down to under 11st 5lbs by the Hardmoors 55. I didn’t go on a diet but basically ate smaller portions, cut out any snacks and avoided pudding during the week. As the weight came off and my speed increased it motivated me to keep going. I weigh myself each Friday morning and I was 11st 3 7/8lbs a day before the race. I decided this year to change my training a bit. Last year when I did the Hardmoors Grand Slam my ultra-season started on 1st January and finished in September. As my main goal this year is the Lakeland 100 in July I decided to start my ultra-training later in the year. So I thought it would be an interesting experiment to train for the Inverness Half Marathon in early March with weekly Fartlek and Tempo runs and see what effect that would have on running the Hardmoors 55. Initially I wasn’t going to do any runs over 15 miles but decided that maybe that was silly so did one 25 mile run 6 weeks before the Hardmoors 55. So my build up to the race was …. All three races went really well and I ran faster than I have done for 3-4 years so I knew I was in decent shape. The question I had was whether my lack of long runs would have an effect. I was relying on the fact that I have been running ultras for 8 years now and my legs and cardio systems are well conditioned. Basically they know what to do! My normal approach to an ultra is to have specific mini-splits for the whole race. These are based on recce runs or previous races. I like to break the race down into bite size pieces. I have found this has helped me to focus on the next small section (3-4 miles) and let the overall distance take care of itself. Over the past year I have been trying a different approach and working on running to heart rate but for this race I took it to another level!! With help from Robert Osfield I had a target HR of 137 for the race. This is based on previous races I have done and my maximum HR (170 bpm). Robert has devised a spread sheet which gives me a target HR for any race from 3hrs to 48hrs. For the Hardmoors 110 last May it was 124 and that worked well. For a race lasting 10hrs it was 137. So I decided to trust that and aim for that. One week before the race I went up on the Gleniffer Braes and tried to practise running at 137 and found I was fluctuating widely from 125 to 150. I asked on my blog whether that was okay as long as the average is about right. Robert replied that no it’s not okay! I need to keep the range as narrow as possible and don’t let your HR go over 142. Rick Williams also sent a link to a very helpful post written by March Laithwaite (Lakeland 100 organiser) who said the same thing. So I decided I was going to be really disciplined and keep my HR between 132-142 (5 beats either side of my 137 target). I thought it might be difficult but to be honest I really enjoyed it and gave me a focus for the day which really helped. I kept my Suunto watch screen on HR and every time it went over 142 I slowed down and every time it dropped to 132 I went faster! I had my splits from last year and after each mini-split I had a look and compared where I was. Here is a comparison between 2014 when I finished in 10:11:36 and this year’s 9:35:37 (times on my watch slightly different to official times) …. At Lord’s Stones (23 miles) I was only 1min 47 secs up on last year. By Osmotherley (31 miles) I was 6mins 25 secs up but from then on I took bigger chunks of time so by the end I was 35mins 59 secs faster. Another interesting thing is that my average HR for the whole race is very similar but achieved differently! In 2014 the second section my HR was 143 and for the last section 123 because I was walking more and couldn’t get it any higher. Whereas this year that second section was 138 and the last section 132. So I couldn’t quite keep the effort up at 138 (maybe due to the lack of long runs??) but it was 10 bmp higher than last year and I ran that last section from White Horse 12 mins 42 secs faster! Throughout the race I tried to visualise keeping my HR graph as straight as possible. I couldn’t wait to get home, download the data from my watch and see what it looked like (sad I know!!). I was chuffed to see this …. 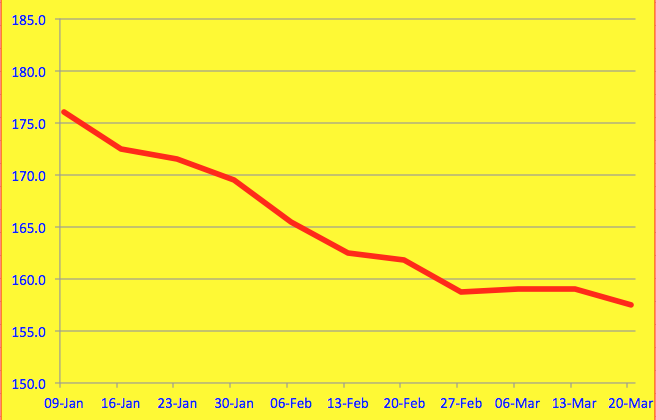 As a comparison here is my HR graph from 2014 …. There are a lot more fluctuations and a general dropping away at the end showing that I was getting fatigued and not able to keep up the same intensity. Strava do some good analysis so I used some of my birthday money (thanks Mum) to upgrade to a Premier member. One of the side benefits of running to HR was that I was so focused on it that I didn’t have time to worry about or think of much else! So my mind didn’t have time to tell me how tired I was or how far to go. Win win!! The thing I did find was though that I had to be very selfish and zone everyone else out. I was here to run my own race and I wasn’t going to stay with people if it meant raising or lowering HR. I still greeted everyone I saw and I did run with quite a few people chatting away but only when it worked with my plan. I don’t think I consciously blanked anyone but if I did I apologise. My next ultra is the Cateran 55 in 8 weeks and I can’t wait to try this again!! I don’t change much from race to race now as I’m really happy with all my gear as it’s tried and tested and works. The only decision I had was on which top to wear. Jo & Hollie bought me a new Ron Hill Top (well I saw it on the Run-4-it stall at Inverness but they paid for it!) and I thought about wearing it for the race without ever running in it. Katrina pointed out in the car as we drove down on the Friday that if that was her I would advise not to wear it so I took her/my advice and wore my green top which is my favourite! Phill Turton commented on Facebook that my green top is more famous than the late Brian Clough’s!! This is another key area and one that I have refined over the years. I feel I have, through trial and error and great input from Cara Sloss, worked out what works for me. The only things I didn’t manage to eat was 2 small pieces of Soreen with jam and a handful of Yoghourt covered cranberries but I ate them the next day so nothing was wasted!! The saying goes that an ultra is 90% mental and the other 10% is in your head! While the physical training is obviously important there is no denying that lots of people struggle in ultras who are fit enough to do better. I treat every race as very important and prepare the best I can. I think this really helps me to be as positive as possible. I feel that if I have prepared well then there is no reason why I can’t do my very best on the day. It doesn’t always work out and I’ve had some real shockers but I’ve always finished and always start expecting the best. For this race everything did come together and I only had one mini struggle with about 5 miles to go. For the vast majority of the race I was loving it. As mentioned earlier because I was focusing so much on my HR I didn’t need to use my motivational mantras I normally use. I did count my breathes a few times but that was to help keep a steady pace going up and not push too hard. I was completely in my own little world running my own race so nothing seemed to bother me. I’m sure there will be other things I will think of but that is the main lesson learnt from my 2015 Hardmoors 55. Next year the race will be probably be held on my birthday so it would be rude not to come back!! This entry was posted in Hardmoors 55, Lessons learnt. Bookmark the permalink. Really enjoyed this John, an excellent read! Excellent post. The HR and splits analysis can comparison between 2014 and 2015 is particularily telling – being more conservative in the first half looks well correlated to how well you were able to maintain your pace late in the race. 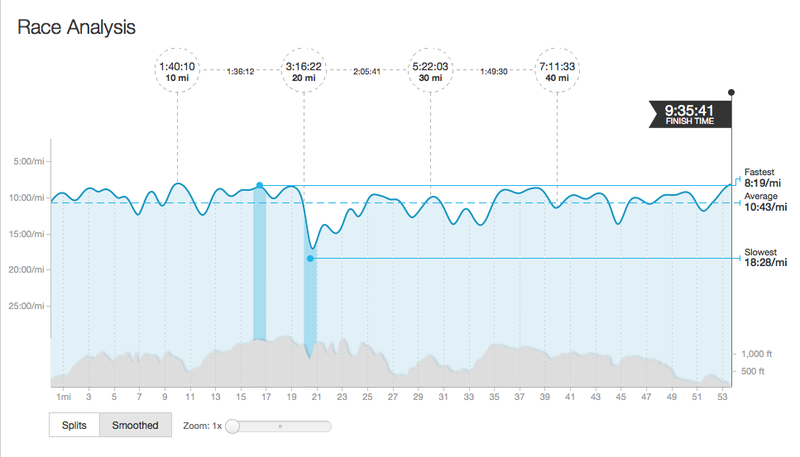 Both the HR and the Pacing graphs are really flat, especially considering how hilly the route is. Pretty text book execution. Personally I don’t buy that ultra’s are largely about what’s going on in your head. You brain is firmly inside your body all the way, it’s bathed in the same blood ciculates through the rest of your body – this means all the same exposure to oxygen, carbon-dixoide, glucose, lactate, hormones etc. Your mental state is hugely affected by the coctail in your blood. There is also the subconsious systems in your brain/nervous system that montior all your bodies systems and movement patterns. The conscious thought processes effectively sit in an little dingy riding in an ocean of body systems that are all keeping your alive and moving forward. In this little dingy your can hint to your body what you want to do, but if it’s not willing or able it’ll override any level of conscious persuain you might attempt. The ocean creates the emotions you feel, it creates the feeling of fatigue. I think can get overly caught up in this battle of mind over matter, but all they are doing is making it tougher on themselves as the consious and subconsious systems shout loader and loader for control. Rather than battle themselves, runners need to take a step back and listen to what their bodies are telling them and respond appropriately. If you give your body what it needs – show that you are responsible captain of the dingy, your subconssious systems (central govnor) will trust you more and give you more room to push yourselves, and do so without creating heavy amounts of fatigue. When it comes to running ultras, what your body needs is to be able to burn the right mix of fuels available, to have the structural resilience to cope with terrain and time on feet, to have the ability to consume all the food and drink that it can handle at the rate it can handle. Being sensible with pacing is part of this dance – it means your fuel mix can remain safely in fat burning zone, can avoid the peaks and troughs in heat generation/loss, can regularily digest food and drink. By treating the body right in this way all your systems remain in a healthy state so the their is no need for your subconsous to create fatigue as a safety system to avoid yourself doing damage to yourself.